Forget about Martech, Adtech, or even Madtech. The next big thing is BadTech. I’m referring to is the backlash against big tech firms – Google, Amazon, Apple, and above all Facebook – that have relentlessly expanded their influence on everyday life. Until recently, these firms were mostly seen as positive, or at least benignly neutral, forces that made consumers’ lives easier. But something snapped after the Cambridge Analytica scandal last March. Scattered concerns became a flood of hostility. 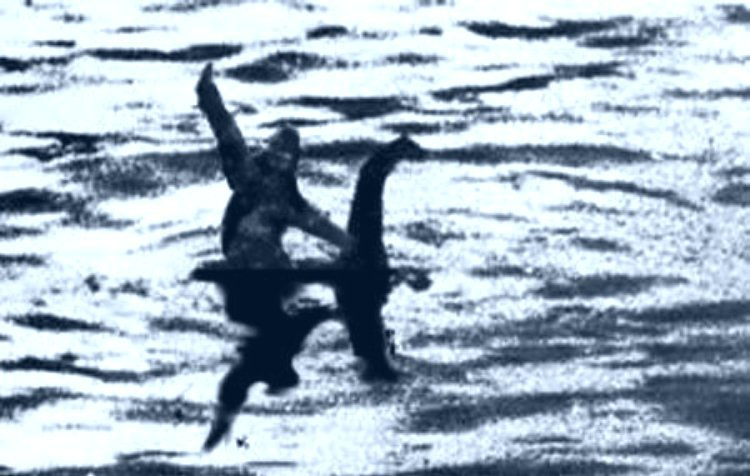 Enthusiasm curdled into skepticism and fear. The world recognized a new avatar of evil: BadTech. Google tracks location even after users turn off Location Sharing. telecom lobbyists have successfully blocked close to 70 privacy bills so far this year. big gaps in social media efforts to block even someone as clearly horrid as Infowars’ Alex Jones – famous for claiming the Sandy Hook school shooting was a hoax. Facebook reinstated social monitoring vendor Crimson Hexagon despite concerns that government agencies were using it to monitor public activities. Amazon’s facial recognition software falsely matched 28 U.S. Congress members with mugshots. Artifical intelligence training data often creates unintentional bias and there's no standard method to prevent this. Russian hackers continue to attack U.S. (and other) elections. clients' customer data was exposed by Salesforce.com (although there’s no evidence that anything was actually leaked). up to 70% of video spend goes to unauthorized sellers. fake followers comprise up to one-third of Instagram influencers’ audiences. few organizations are succeeding in their AI investments. only Amazon ranks in the top five of the 20 most trusted companies. Google, Apple and Microsoft are six, eight, and nine. Facebook isn’t anywhere on the list. European Union puts teeth in regulations that require removal of extremist content within one hour. California legislature passes strong data privacy law. advertisers infatuation with blockchain is starting to fizzle. But all is not perfect. BadTech firms still plunge ahead with dangerous projects. For example, despite the clear and increasing dangers from poorly controlled AI, it’s being distributed more broadly by Ebay, Salesforce, Google, and Oracle. The press continues to get it wrong. This New York Times Magazine piece presents California’s privacy law as a triumph for its citizen-activist sponsor, when he in fact traded a nearly-impossible-to change referendum for a law that will surely be gutted before it takes effect in 2020. So welcome to our latest brave new world, where BadTech is one more villain to fear It's progress that people recognize the issues but we can't let emotion overwhelm considered solutions. Let’s use the moment to address the real problems without creating new ones or throwing away what’s genuinely good. We can't afford to fail. Customer Data Platform vendor Treasure Data today confirmed earlier reports that it is being purchased by Arm Limited, which licenses semi-conductor technologies and is itself a subsidiary of the giant tech holding company SoftBank. The price was not announced but was said to be around $600 million. The deal was the second big purchase of a Customer Data Platform vendor in a month, following the Salesforce’s Datorama acquisition. Arm seems a less likely CDP buyer than Salesforce but made clear their goal is to use Treasure Data o manage Internet of Things data. That’s an excellent fit for Treasure Data’s technology, which is very good at handling large volumes of semi-structured data. Treasure Data will operate as a separate business under its existing management and will continue to sell its product to marketers as a conventional Customer Data Platform. While Arm is an unexpected CDP buyer, the deal does illustrate some larger trends in the CDP market. One is the broadening of CDP beyond pure marketing use cases: as critics have noted, unified customer data has applications throughout an organization so it doesn’t make sense to limit CDP to marketing users. In fact, the time has probably come to remove “marketer-managed” from the formal definition of CDP. But that’s a topic for another blog post. A complementary trend is use of CDP technology for non-customer data. Internet of Things is obviously of growing importance and, although you might argue thats IoT data is really just another type of customer data, there’s a reasonable case that the sheer volume and complexity of IoT data rightly justifies considering it a category of its own. More broadly, there are other kinds of data, such as product and location information, which also should be considered in their own terms. In any case, the Treasure Data acquisition is another milestone in the evolution of the CDP industry, illustrating that at least some of the systems have unique technology that is worth buying at a premium. I can imagine some of the other data-oriented vendors being purchased for similar reasons. I can also imagine acquisition of companies like Segment and Tealium that have particularly strong collections of connectors to source and target systems. That’s another type of asset that’s hard to replicate. So we'll see how the industry evolves. Don't be surprised if it follows several paths simultaneously: some buyers may take an enterprise-wide approach while others limit CDP use to marketing. What I don't yet see is any type of consolidation around a handful of winners who gobble up most of the market share. That might still happen but, for now, the industry will remain vibrant and varied, as different vendors try different configurations to see which most marketers find appealing. So, how do all these pieces fit with each other and the rest of Salesforce Marketing Cloud? It’s possible that Salesforce will let Datorama, SessionM, and Interaction Studio independently build their own isolated databases but the disadvantages of that are obvious. It’s more likely that Salesforce will continue to argue that ExactTarget should be the central customer database, something that’s been their position so far even though every ExactTarget user I’ve ever spoken with has said it doesn’t work. 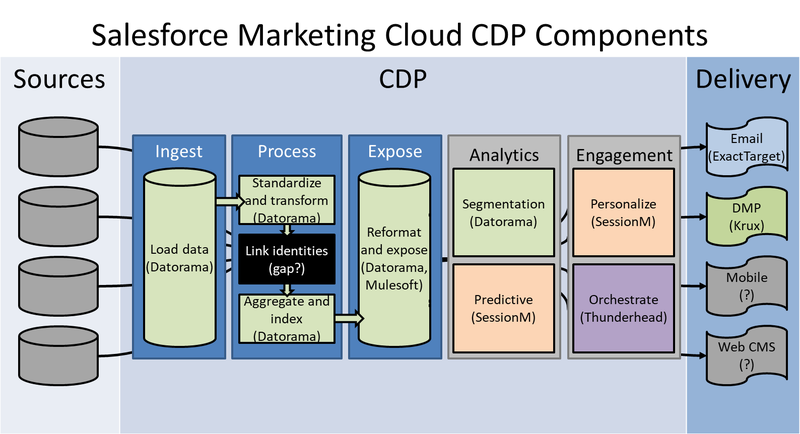 The best possible outcome might be for Salesforce to use Datorama as its true CDP when a client wants one, and have it feed data into SessionM, Interaction Studio, ExactTarget, and other Marketing Cloud components as needed. We'll see if that happens: it could evolve that way even if Salesforce doesn't intend it at the start. Looking at this from another perspective: the combination of Datorama, SessionM, and Interaction Studio (Thunderhead) almost exactly fills every box in my standard diagram of CDP functions, which distinguishes the core data processing capabilities (ingest, process, expose) from optional analytics and engagement features. Other Marketing Cloud components provide the Delivery capabilities that sit outside of the CDP, either directly (email and DMP) or through integrations. The glaring gap is identity linkage, which Datorama didn't do the last time I checked. But that's actually missing in many CDPs and often provided by third party systems. 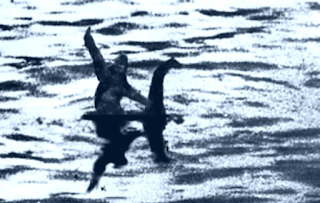 Still, you shouldn't be too surprised to see Salesforce make another acquisition to plug that hole. If you're wondering where Mulesoft fits, it may play a role in some of the data aggregation, indexing, reformatting, and exposing steps; I'm not clear how much of that is available in Datorama. But Mulesoft also has functions outside of this structure. 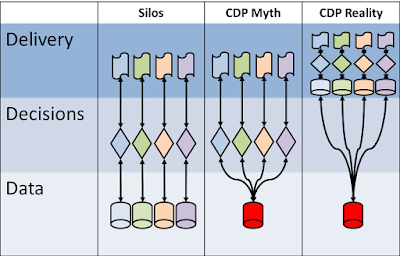 In short, it's quite true that Salesforce has all the components of a CDP, especially when you include Datorama in the mix. This is a nuance that was rightly avoided in the early days of CDP as we struggled to explain the concept. 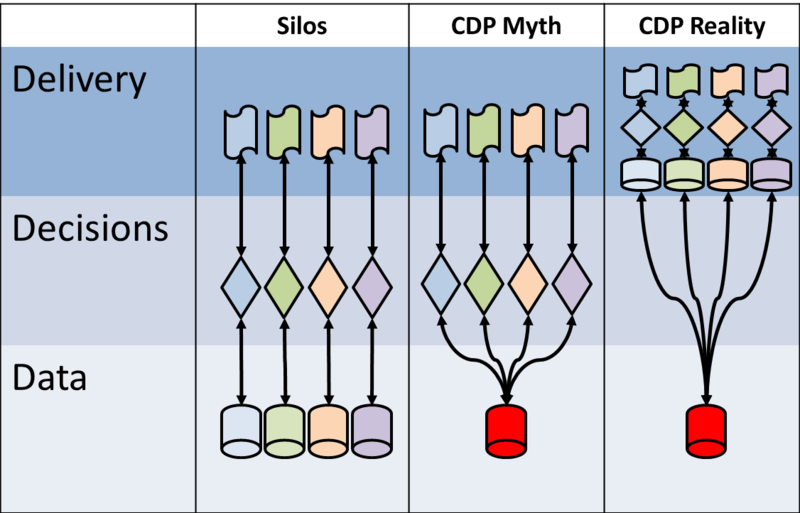 But I think now that CDP is well enough understood that we can safely add some details to the picture to make it more realistic and avoid creating false expectations. I'll try to do that in the futre.